We just got a new 10 week old puppy and have had him just over a week. We are going to crate train him but haven’t yet. I take him outside as often as I can, but he will hold his poop and pee. As soon as we get inside he starts looking for a place to go, or just stares at me and goes on the spot. I’ve tried going inside and right back out, but no avail. I have had him pee only twice outside, rewarded him nicely. He refuses to poop outside. He only poops twice a day, after breakfast and after dinner. Again I time it to 20 minute to up to an hour after. He will wait until I get him back inside and get distracted and poop by the door. He pees everywhere. I interrupt him when I can but he pees through the interuption and just looks at me. I have had him outside for 30 minutes first thing in the morning when he wakes up and nothing. The moment we get inside and I glance away he pees. I don’t know what to do. He has amazing blaster control to be able to hold it like he does. Were you able to resolve this issue with your puppy? I am currently having the same issue with my puppy unfortunately. I had the same issue and even thought to return the puppy back to who I got it from. But she’s learnt a lot, and yes, crate training is the most efficient way to train them to pee and poop outside or on a pee pad. Make sure you’ll limit the crate space to her size only. she also sometimes peed on her blanket inside the crate. accidents happen. I also bought a playpen and left her with two pee pads in it, so when I’m away for longer hours, she pees on one and poops on another one. if you leave her one pee pad only, she poops one it, and pees on the floor. I got my English BD last week at 7 weeks old I’ve never seen a puppy pee so many times. I talked to the breeder and she said puppies pee a lot but she didn’t think 20 to 25 times a day. Needless to say I got quite a relief after reading this post Duncan is pretty much what this schedule was written for. Thanks for sharing this. Same here! My puppy peeps every 15 minutes! A lot of breeders just leave puppies in a cage with something to absorb all the pee and poop. Sad but it’s true. Hi, I have a German Shepherd puppy that’s about 12 weeks old. I see that in your potty schedule a typical puppy should pee about 24 times a day. When my puppy is awake, I kid you not, she goes to the door to go out and pee probably every 20 minutes. And if I try to wait it out and make her hold it, she just pees right then and there. I know some people may say she’s doing it to go outside and play, but she whines when she goes to the door and just gets louder the more I try to ignore her. Do you have any suggestions on trying to train her to hold it? I’m definitely gonna be calling the vet as well to get it looked at. Congratulations on your new puppy! One thing you might try if you already haven’t is put your puppy on leash every time you take her outside. At 12 weeks old I wouldn’t try and make her hold it. If she indicates she needs to go out then put her on her leash, take her to her potty spot, let her potty, then bring her back in. As she gets older she’ll start getting better at holding her bladder. If you haven’t already take a look at our article on how to potty train a puppy: https://puppyintraining.com/how-to-potty-train-a-puppy/. Good luck with your training! I have a 5 month old Labrador puppy Scooby . He pees like 5 to 10 times whenever he plays the intensity with which we play is high . We run a lot , we play intense tug and he barks a lot . Is this normal ? . We had him checked for Polyuria and Diabetes both results came out negative . We are very worried that we are not able to find a solution for our puppy . We’ve had many puppies pee when they get excited. Our solution has been to try and stay more calm around our puppies rather than rile them up. So far all of our puppies have eventually outgrown this behavior. However, we have had friends tell us that their pups have continued to have a problem with their pup’s peeing when excited. I have a 4 months and 3 week old girl Yorkie. We have her about 1 month at this point. Being it is still cold where we live and she is only 3.2 lbs we have wee wee pad trained her. She poops 5-6 times in a 24 hour period and pees a lot! I don’t have an exact number. Sometimes it’s a really big pee and sometimes it’s just a little pee. We do keep food and water in her cage at all times because she is so tiny and is still growing. She is completely potty trained and runs into her “pen” to pee on the pad. Is this normal? Is she peeing so much because she has access to water all day? And why is she drinking so much? Should I be concerned? Congratulations on your new puppy! These are questions you probably want to ask your veterinarian. 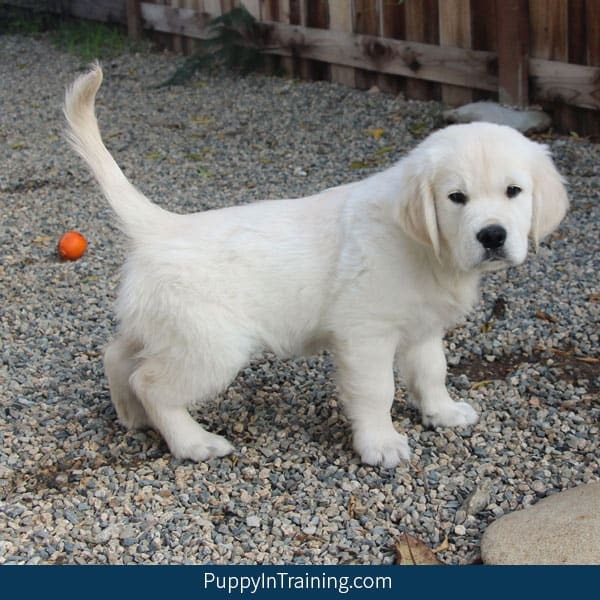 Most of the puppies we work with are larger breed dogs like Labrador Retrievers, Golden Retrievers, and German Shepherds and that is what we based our puppy potty schedule on in this blog post. Again if you’re concerned with your puppies bladder control please talk to your vet. Congratulations on your new puppy! Have you noticed her drinking a lot of water? Does she pee because she’s excited? 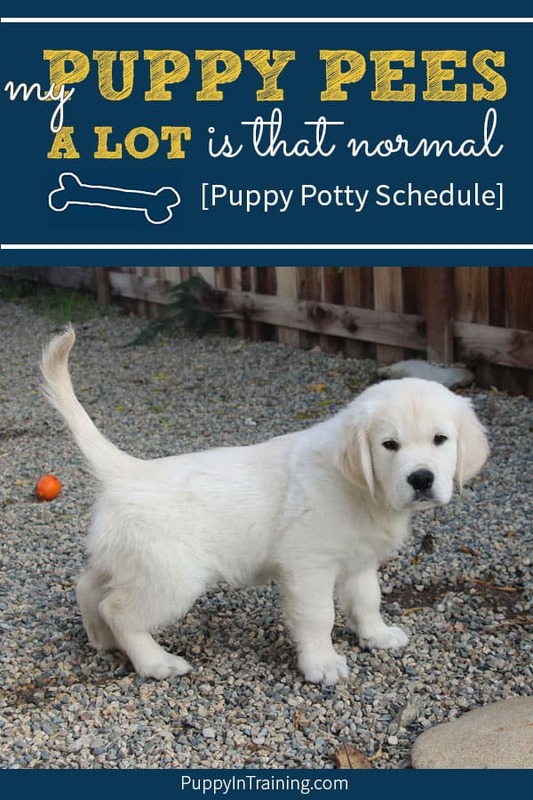 You might try keeping a potty schedule noting when she eats, drinks, sleeps, pees, and poops. It could help you predict her behaviors a little better. Also, she’s still young and it could just be that she doesn’t have full control of her bladder yet meaning even she doesn’t know when she has to pee sometimes. Hopefully that helps. Good luck with your puppy!